Ride from dusk to dawn in #1 selling boot worldwide with the best fit, flex and comfort. I've been wearing thirty-two boots for a while never let me down. 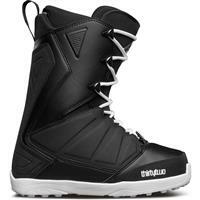 Durable and a medium flex to ride all over the mountain. There is a reason they call this boot 32's 'bread and butter'. Its all the support you need in a good looking, medium flex, comfortable package. Add in the Intuition heat moldable liner and you have a great performing boot that will make your feet happy all day. No matter if you like riding park or are just sending down your first black diamond, this boot will help you get the job done. Awesome boot that has won best boot award multiple times. Right out of the box is comfortable and is in the middle for stiffness. Lightweight boot. easy to lace up. I am a size 11.5 shoe and i put on the size 12 boots and my toes are touching the front so the boots may run a little smaller. i have it laced up pretty tight and my heel does slide a bit in the boot. The liner does keep your feet warm and the padding is comfortable. The boot is pretty flexible, not super stiff. This is my second pair of Lashed On, third pair of Thirty-Two boots, they are great. The boot forms to your foot unlike anything else! The liner and lace system combine to keep your foot and heel locked in all day. In other boots I have experienced cramping in my foot, but never in these. The boots are great and are perfect for all around use.